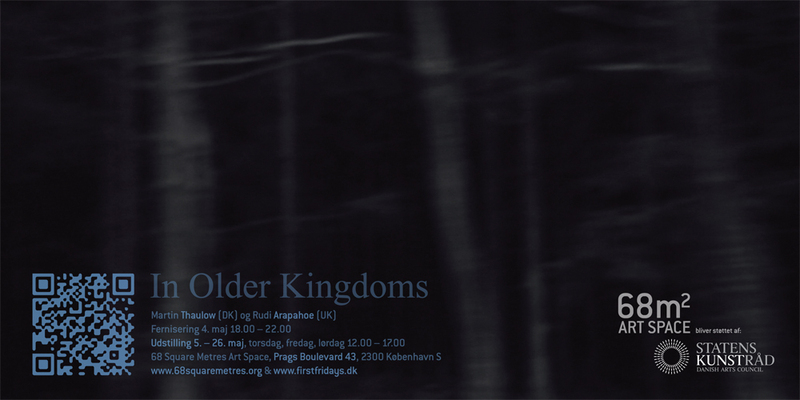 68m2 invites you to become part of the new work In Older Kingdoms, a collaborative project by Martin Thaulow and Rudi Arapahoe. An installation combining video, audio and the web, it features 5 video layers which are mapped and projected in the exhibition space, and auditive landscapes which are triggered by movement in the space. Real time video from the exhibition space becomes part of the 5 projected video layers, which are merged into one, and together with the audio broadcast on a Livestream channel on the internet. In Older Kingdoms is thus created live by you in the gallery, and also allows you to view its constantly changing forms from cyberspace. It deals with time, decay and the parallel universes we all live in and interact with. The investigation of these themes continues in the second installation, Contraction. 6.500 meters of gift ribbon hang from the ceiling, forming a forest to go adventuring in. At the heart of the installation a video loop shows a modern dance performed in an old brick factory, danced by a woman who was a modern ballet dancer some 30-40 years ago. The installation playfully and provocatively merges fantasy and reality, working with the invisible borders. Contraction is Martin Thaulow and Rudi Arapahoe’s previous collaboration. In Older Kingdoms was Livestreamed during the opening hours.